You might think a cupcake with hearty pumpkin is heavy or dense. The magicians at Martha Stewart have created a moist, light pumpkin cupcake. Cinnamon, ginger, nutmeg and a pinch of pie spice add to the warmth of this fall cupcake. As the cake is not very sweet, the cream cheese frosting is welcome. The recipe is almost the same as the pumpkin cupcake at MarthaStewart.com 1-on-1 Bob's Red Mill Gluten-Free Flour was substituted for flour. Also, pie spice was added to the mixture. P.s. While the pumpkin cake and cream cheese frosting are gluten-free. 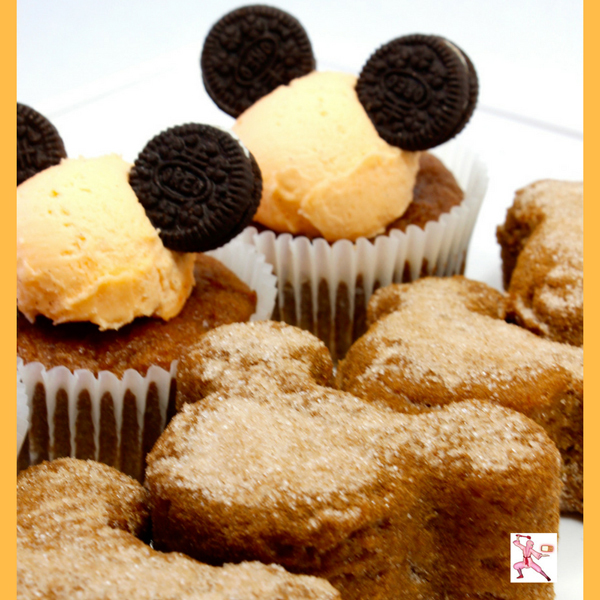 Mickey Mouse's Oreo Minis ears are not gluten-free. 1. Preheat oven to 350 degrees. Line cupcake pans with paper liners; set aside. In a medium bowl, whisk together flour, baking soda, baking powder, salt, cinnamon, ginger, nutmeg, and allspice; set aside. 2. In a large bowl, whisk together, brown sugar, granulated sugar, butter, and eggs. Add dry ingredients, and whisk until smooth. Whisk in pumpkin puree. 3. Divide batter evenly among liners, filling each about halfway. Bake until tops spring back when touched, and a cake tester inserted in the center comes out clean, 20 to 25 minutes, rotating pans once if needed. Transfer to a wire rack; let cool completely. 4. Frost with cream cheese frosting: Whip 1 (8-oz) package of softened cream cheese together with 1/4 cup room temperature butter, 1 tsp. vanilla paste (or extract) and drops of orange extract. Slowly add in 4 cups of powdered sugar. 5. Scoop the frosting onto the cupcakes with a mini ice cream scooper. Tuck in Oreo Minis for Mickey Mouse ears. 6. Delcious Option: Combine 10 T fine sugar with 6 tsps cinnamon. Sprinkle onto the cupcakes.